In 2013 the University introduced a new centralised lecture capture service (known as the Podcasting Service) and a policy governing its operation. Support information for staff can be found here and answers to frequently asked questions from students can be found here. If you are a member of staff whose teaching will be recorded, we strongly recommend you read the essential information page. This page summarises general interest information about the lecture capture service and its operation over the past few years. As it has become common for other Universities to request and reference information about our lecture capture service, we will endeavour to keep this page up-to-date. Currently lecture capture is offered in 322 lecture theatres and teaching spaces across campus. This number tends to fluctuate regularly as teaching rooms are brought in and out of service. In the most recent academic year approximately 55,000 hours of lectures were recorded – being viewed almost 5 million times. Although the lecture capture service is now large and ubiquitous, it originally started out as a small pilot in 10 lecture theatres and has grown over time through a series of projects, as shown in the table below. Prior to 2013 lecture capture was on a voluntary basis and attracted between 10% to 20% of academics. During the summer of 2013 Senate – the principal academic authority of the University – considered and passed a policy governing the future use of lecture capture at the institution. The policy can be read in full here. The opt-out policy radically changed lecture capture at the University; rather than it being a limited experience, it was suddenly available on the majority of courses. Teaching staff are emailed a link to an opt-out web page at the start of semester from which they can opt-out on a lecture-by-lecture basis and change their choice at any point during the academic year. Starting in September 2016, University of Manchester students can now access a unique and specialised form of support. If a student is registered with the Disability Advisory Support Service (DASS) and DASS believe lecture capture will support a students’ studies, they can prescribe lecture capture as a reasonable adjustment. This means that 100% of lectures will be recorded for these students even if they have been opted-out of the recording process. Additionally, any lecture that is being withheld for editing will be released to DASS registered students after 24-hours if it remains unedited. Approximately 2,000 students were provided with this additional study aid in 2016/17 and it was very well received. Over 82% of students described the additional recordings as essential to their studies, 83% of students made frequent use of the material and 94% of surveyed students felt they would go on to gain higher marks due to the lecture recordings. DASS provides the recommendation for lecture capture with a targeted approach; individual cases are assessed for their requirements and additional lecture capture is only provided when it will be of benefit to the student concerned. Of the 5,551 students registered with the DASS office in the 2016/17 academic year, 2,126 received additional lecture capture. This cohort in descending order consists of: 49.6% with learning disabilities, 42.9% with mental health disabilities, 13.8% with other disabilities, 5.4% with multiple disabilities, 5.3% with unseen disabilities, 2.0% autistic/Aspergers Syndrome, 0.9% mobility disabilities, 0.9% deaf/partial hearing, 0.5% blind/ partially sighted. One of the main concerns many institutions express about lecture capture is the potential impact on attendance. A minority of courses record attendance routinely at the University of Manchester at there is no standard method of attendance monitoring across the University. 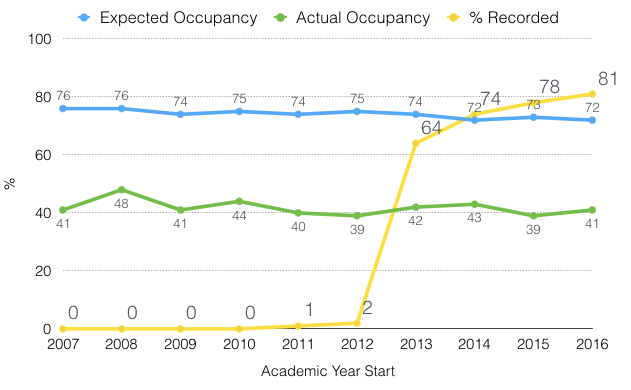 Recently we have examined ten years of room occupancy data. This data is part of a standard report conducted by many Universities as part of their estate utilisation reporting. Every year for the last ten years a room occupancy survey is conducted. This involves using the timetable to look at the planned booking sizes for classes (expected occupancy) and then survey staff conducting head-counts in classrooms obtain the actual occupancy. This is not exact attendance data, however if attendance had declined with the introduction of lecture capture we would expect to see the actual occupancy of rooms drop as lecture capture coverage increases. Based on the data below, there does not appear to be a correlation between lecture capture provision and the actual occupancy of teaching rooms. The lecture capture service at The University of Manchester is primarily based on an open-source lecture capture system known as Opencast, which orchestrates timetable synchronisation, the planning of the recording process, processing of videos and their distribution to our students. Opencast is free to use for educational institutions and has provided us with a flexible, highly scaleable and cost effective approach to lecture capture. Opencast has a community of users who maintain, improve and support the software system. An annual summit is held to share best practice in the lecture capture community and to decide the future direction of the product as part of the wider Apereo Foundation. The systems that are used in lecture theatres are generic mini-itx PCs running an application called Galicaster which is another free open-source application offered by a commercial company called TELTEK. The open-source nature of these systems has allowed us to make innovative changes such as a recording for disabled students (mentioned above), our semi-autonomous editing system based on QR codes and the extreme reliability of the system. Some locations on campus have tracking video cameras installed which allows high-quality video of the lecturer to be recorded in addition to, or instead of, what is shown on the projector screen. This can be particularly beneficial for subject areas where the lecturer makes use of the black or whiteboards regularly, as this would not normally be recorded as part of the podcast. At the moment, the use of tracking cameras is via staff opting-in to their use, more details can be found on this page. The total cost to equip all 322 rooms including staffing and equipment for the capitol phase of the project came to £1.2 million. The team responsible for running the lecture capture service comprises five people whose duties also cover video-on-demand services, live streaming and some bespoke VLE support.